Ales is a European artist, born in Czech Republic in 1965. He studied at LSU under Professor Rudolf Kubicek, followed by additional private study with Academy Professor Pavel Vavrys-winner of UNESCO art competition in Paris 1989 and Pinacoteca De Estado in Sao Paolo- Brazil. He received an additional degree from Belohorska Art School in Prague. Ales won his first International Art Competition in Congo - Africa at age 7. His inventive color expressions have harmonies of emotion and energy. Partially withdrawn from reality, yet not abstract, his style has an element of mystery, suggesting rather than defining. "I love to paint people, their characters and scenes that influenced me and our whole society in a major way. Each painting has a message and meaning. Most of my paintings are done in several layers of paint - just like our lives. There is a purple under orange - like fairness under destiny". Ales's art work has been featured in many international shows and galleries such as in Prague Czech Republic, Chicago - Illinois, but also in his area of residency at the Museum of Art, Artlink, and Orchard Gallery in Fort Wayne, Indiana. His artwork appeared on two covers of international magazine Soundboard, as well as on posters of several international classical guitar competitions. 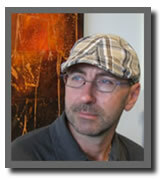 His paintings are in private collections in many European countries, Australia and United States.